Caption: R. J. Fergusson. Entered Service of the City May 16th, 1945. Deputy City Clerk December 1st, 1976. City Clerk September 23rd, 1979. Retired April 26th, 1986. Photograph shows Charles A. Tanner, former Reeve of the City of West Kildonan, 1920-1923. Photograph shows Edmund Partridge, former Reeve of the City of West Kildonan, 1914-1918, 1924, 1926-1945. Photograph shows G. R. Davidson, former Reeve of the City of West Kildonan, 1925. Photograph shows Edmund M. Wood (1858-1936), Solicitor. Date of photograph is probable, [1884?]. Photograph shows W. T. Tallman (Street Commissioner), R. Beverley (Foreman) and J. W. McKinley (in charge of wood camps). Date of photograph is January 31, 1923. Photograph shows George Hugh Hadskis (1838-1915), former Tax Collector. Date of photograph is probable, [1884?]. Caption: Thos. Mitchell. Entered Service of City, September 26th, 1922. Deputy City Clerk, 1962-1964. 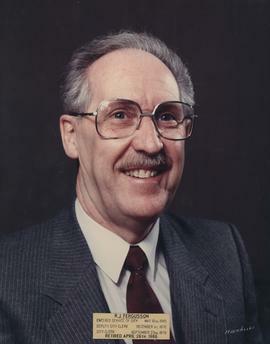 City Clerk, 1964-1966. Retired, March 13th, 1966.